Well my 1st valentine's day card I made my eldest took it for his girlfriend. So I decided to pull my finger out and make another one for my hubby until my youngest complained that he has not got a card for the last couple of years so I decided to make him one too. 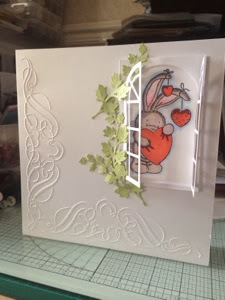 I made an 8x8 card using centura pearl used card then cut another 8x8 piece of card and used chantilly embossalicious 8x8 embossing folder, and I used collal all purpose glue to stick it onto the card. The image is from the Bebunni range rubber stamp called hearts using memento ink, then I coloured the image with my beloved spectrum noir pens. And the window is a die called open window by Britannia Die and I used an ivy die'sire die and used core'dinations card. Then I added some green gems. My husband's card I also make it an 8x8 pearlised card, then I matted gold pearlised card and for the last piece of white card I embossed using the embossalicious roses folder and matted and layerd using collal glue. I then got 4 small sheets of red core'dinations card stock and used my hearts die'sire die and cut and embossed 4 hearts. I folded 2 full hearts in half so that I could make a 3d effect. 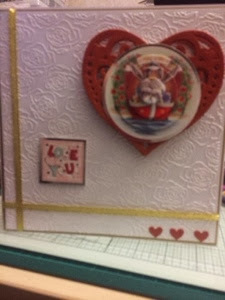 The decoupage is from the bebunni love paper kit and I put it on the heart. And the sentiment is also from the paper pack. And the ribbon is from my personal stash. I just hope they both like their cards. I love your little window - and such a cutie peeking out! Love that little window card - so cute - both super cards.